20 years SAP Labs China: To “innovate in China for China and the world” requires more than strong engineering power. When politicians visit large international fairs, they carefully decide who they honor with their presence. So when Mr. Miao Wei, Minister of Industry and Information Technology, and Mr. Ying Yong, Mayor of Shanghai, stopped by the SAP booth at the China International Industry Fair (CIIF) a few weeks ago, it was another confirmation for the growing role that SAP Labs China plays in the country´s economic development. Celebrating its 20th birthday this November, the third largest lab in the global SAP Labs Network has become a thought leader in many technology topics, from Industry 4.0 to cyber security. “A few years ago, it was impossible for us to get a meeting with a mayor or a minister. SAP was not really on the radar of Chinese government officials,” says Ruicheng Li, the managing director of SAP Labs China. “Today, when there are discussions about manufacturing, digitalization, or security, we are seen as a major player in China,” says Ruicheng. China has become the world´s manufacturing powerhouse. In 1990, China produced less than 3 percent of the world’s manufacturing output when measured by value; by 2017, it produced more than 25 percent. To remain competitive, China has realized that it needs to take its manufacturing industry to the next level by reducing overcapacity and costs, increasing the quality of the products and improving productivity and sustainability. In addition, consumers are demanding individual, high-quality, but inexpensive products within shorter periods of time. 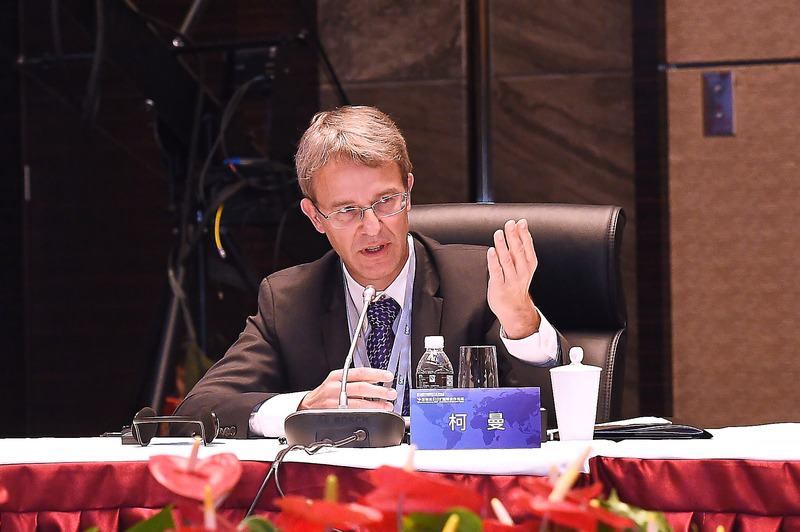 “CIIF is a great opportunity to demonstrate, how SAP can help China upgrade its manufacturing sector through digital solutions and how we co-innovate with leading robotics manufacturers, high-speed data infrastructure companies and other software firms in China,” says Ruicheng. 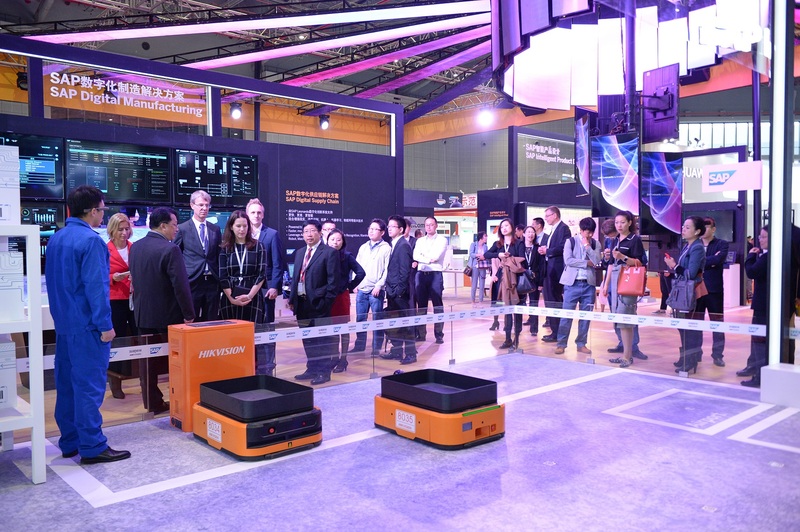 At CIIF, the largest industry fair in China with more than 2,500 exhibitors, SAP showcased – among others – three solutions to the government officials and the public: SAP Digital Supply Chain, SAP Intelligent Product Design and SAP Smart Manufacturing. The Belt and Road Initiative (also known as “One Belt, One Road”) is a development strategy proposed by China’s President Xi Jinping that focuses on connectivity and cooperation between Eurasian countries. The strategy underlines China’s push to take a larger role in global affairs with a China-centered trading network. The routes cover more than 60 countries and regions from Asia to Europe via Southeast Asia, South Asia, Central Asia, West Asia and the Middle East, currently accounting for around 31 per cent of global GDP and around 34 per cent of the world’s merchandise trade. By 2050, the Belt and Road region aims to contribute 80 per cent of global GDP growth, and advance three billion more people into the middle class. “Made in China 2025” is an initiative to comprehensively upgrade Chinese industry. The initiative draws direct inspiration from Germany’s “Industry 4.0” plan, which was first discussed in 2011 and later adopted in 2013. The heart of the “Industry 4.0” idea is intelligent manufacturing, i.e., applying the tools of information technology to production. The goal is to comprehensively upgrade Chinese industry, making it more efficient and integrated so that it can occupy the highest parts of global production chains. The plan identifies the goal of raising domestic content of core components and materials to 40% by 2020 and 70% by 2025. These and several other strategic initiatives enacted recently show that China has put a very strong focus on digitalization and making its economy future-proof. At the same time, the country is aiming to boost its domestic IT industry and fostering a number of globally competitive internet and IT companies. Joe Chang is a partner and co-lead of technology and investments for Eight Roads Ventures in Greater China and an expert in enterprise IT. He is convinced, that “China will inevitably become the world´s IT market and IT companies cannot win globally without China.” Predominant reasons for him are a huge digital consumer base, a culture of fast new technology adoption, ubiquitous mobility and a lack of legacy infrastructure as well as the Chinese government´s push for a consumer and more service-oriented economy. This will require new technology solutions to deliver, Chang says. He adds that “it will be increasingly important to be aware of what´s happening in China to stay on top of technology trends.” Such as artificial intelligence. “Given China´s massive pools of data, the country will increasingly become a hub for A.I. development and investment,” he says. In July, China’s State Council issued guidelines on developing A.I. inside the country and set a goal of becoming a global innovation center for the technology by 2030. Not to forget an ever-increasing pool of talent. Not only do millions of STEM (science, technology, engineering, mathematics) graduates enter the Chinese job market every year. According to Chang, the country’s IT companies have also been pushing hard to attract the best talent from Silicon Valley, mostly Chinese scientists who study and work in the US. For Clas Neumann, head of SAP Labs Network, Chinese companies have already emerged as global tech leaders. Clas has been involved in SAP’s business in China since 1995, when the company founded a subsidiary within the Tsinghua University campus in Beijing. At that time, he was responsible for creating SAP’s first China-specific version of the ERP solution R/3. Clas has also been instrumental in the development of SAP Labs China which was founded as the “SAP Developent Center China” a few years later. “Our first 10 customers, after we entered China in 1995,” Clas recalls, “were from a group of large joint ventures between foreign multinationals and Chinese conglomerates. Today, the vast majority of our customers are Chinese companies.” Also, IT giants such as Alibaba, Tencent (“WeChat”), Baidu, Lenovo and Huawei belong to the growing group of partners and customers SAP is doing business with. Strong ties to the corporate sector as well as to Chinese research institutes have enabled SAP Labs China to transform into a global development hub which innovates “in China for China and the world” and which fosters a vibrant ecosystem for driving co-innovation.